The original Google Nexus 7 is now 12 months old and has been replaced by a new version that has upgraded much of the tablet – retina screen, faster CPU, more RAM and a camera. Considering it will be only £20 more than last years model that’s quite an upgrade for an affordable tablet. I’ve had my Nexus 7 for just over 9 months and while it’s been a good device the overall experience makes it hard to really recommend an Android tablet. One of the big selling points of Android 4.2 was Project Butter. Finally Google had addressed underlying performance issues so that there would be no stutter, scrolling everywhere would be smooth and Android could finally be viewed as an equal to iOS from a performance perspective. 9 months on and I have to say that there is still a considerable performance difference between Android and iOS. 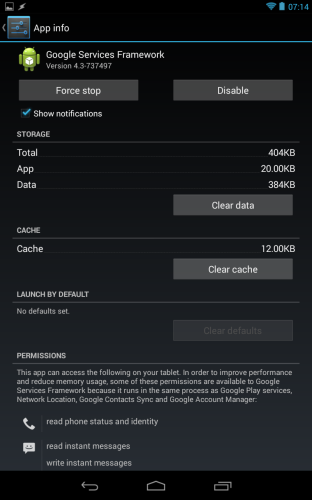 On the Nexus 7 the performance issues have been exaggerated by an overall slowdown over time. This has been well documented and I was seeing it too. I’d launch Chrome and it would sometimes take 20 seconds just to launch and show the 2 or 3 tabs I had open. I tried many of the cleaner tools that are in the Google Play store and while they had an impact for a week or two the system would eventually fall back to it’s usual slow self. Thankfully Android 4.3 has enabled trim support and this has certainly had an impact over the last week but there is still a noticeable lack of smoothness throughout Android as a whole and I’ve got no faith that the stuttering won’t get worse again over time. Even one of the most glowing reviews of the 2013 Nexus 7 acknowledges that it still has performance issues at a fundamental level. Well played Android. Android’s flexibility is fantastic, especially when compared to iOS. However when things go wrong it feels like you are dumped back a decade when trying to fix it. 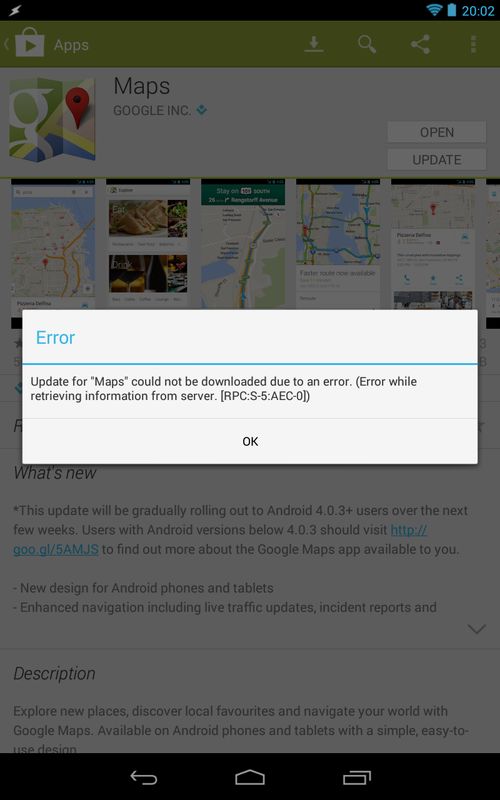 Just this week after applying Android 4.3 I hit a major issue – I couldn’t update any applications from the Google Play store. Worse, the error message was gibberish. Now, rerun Google play store. No dice. All applications would fail to update. So then it was onto the next fix all the while thinking that this felt like trying to fix an issue on Windows 95. That almost fixed the problem except I couldn’t update Google Maps as it failed with the same error. Sigh. I tried again this morning and still had the same problem. So I wiped all accounts from the Nexus, wiped data on the Google Play Store and Google Services Framework applications, rebooted the Nexus and then added my primary Google account. Finally I could update Google Maps. What a farce. This isn’t the first time I’ve had issues that forced me to clear caches from applications to get them back running properly again and it’s one of the reasons I don’t recommend Android tablets to friends and family as the support time is far higher than with iOS. Application availability, especially for tablets, is still stronger on iOS than it is on Android. 99% of the time app’s will release first for iOS and generally be the better version. This hasn’t really improved over the last 10 months. I’m sure for phones it’s different but I can only compare what I use which is iOS and Android tablets. The exclusives are to be found on iOS and there is still a richer ecosystem on iOS when compared to Android. Should I buy a Nexus? That depends on who you are and what you want to do. Want to customise your device, root it, make it your own and happy to mess around when things go wrong – the Nexus 7 is great and the new hardware looks superb for the price. For everyone else I’d recommend iOS without any hesitation. Superior experience, great performance and devices that in general just work. I still fire up the Nexus from time to time but I’m really back on the iPad even for reading despite the size and weight. Speed wins.